We’re setting up shop in the Barn at the Pinch of Salt for the Holidays event at Salt at Our Kaka’ako! You’ll find our full line available at our special buy more save more discounts! Knock off all those names on your list early! We are extending the Small Business Saturday discount through the night at Honolulu Night Market. Join us at this fun event for 15% off! So many yummy things will be coming out for Small Business Saturday. We are restocking the shop post Black Friday madness with all new goodies! We’ve updated many of our products, and will also be featuring our newest Retro Blooms print in the full range of colors and styles. We can’t wait to share what we’ve been working on the past couple of months. AND the whole shop is 15% off all day! Make sure to put us on your shopping schedule this coming Black Friday! We will be having an amazing sale in store and online, and trust us, you do not wanna miss these deals. To show appreciation to some of our followers on social media we have come up with an awesome giveaway that will take place on the Jana Lam Shop + Studio Instagram @janalamstudio . We hope you will take the chance to beat the Black Friday crowds by entering our giveaway for early access to this sale! You and an awesome shopping buddy of your choosing will have a chance to enjoy 3 days of early shopping in the studio (where we keep most of our stock), or our online shop! Winners + their friend will be able to shop the sale the week leading up to Black Friday (November 19-21). The contest will close Friday November 16th at 12 am (HST) and the winners will be announced Saturday November 17th. Head on over to @janalamstudio on Instagram for the rules, and good luck! Shop a sneak of the new look of Jana Lam products at 20% discount! Nordstrom shoppers! Get the Bird of Paradise Adventure Collection and Nordstrom Rewards at the same time! Jana will be bringing the full collection the the Trend Department on the 2nd Floor to answer questions about the collection and chat about all your future adventures! Spend over $200 and get a free Aloha Tote! Join Jana Lam and all your fave local brands for a the perfect Holiday shopping event at Salt at Our Kaka'ako. Jana Lam will be popping up with fun new stuff at Art + Flea's Beach Market at the 2017 Greenroom Festival held at Waikiki Shell. Don't miss out! It's that time of year again! We are excited to return to the Made in Hawaii Festival. You will find Jana Lam in her usual booth with lots of new goodies and discounts. Not to be missed! Trust us!!! Jana Lam is popping up at the 2017 Best of Honolulu Festival. 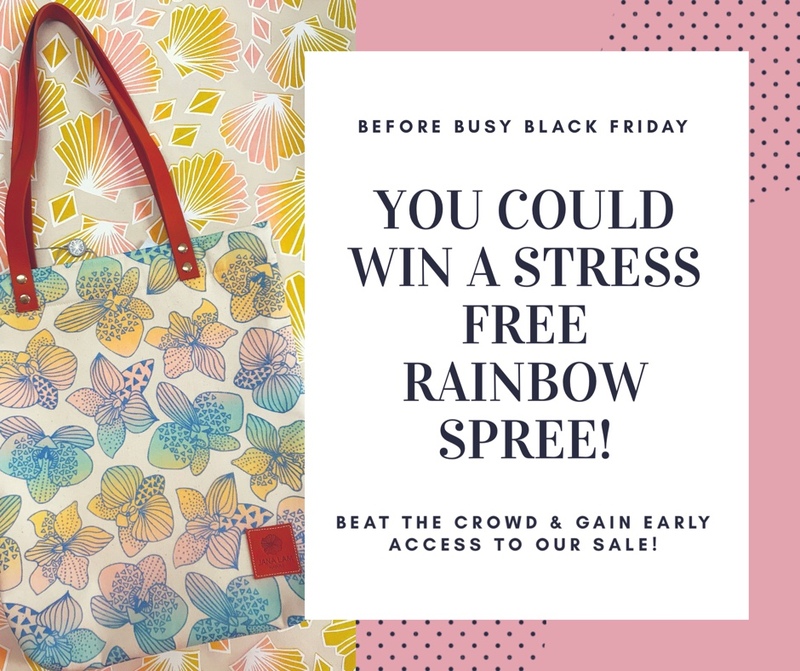 There will be plenty of deals and steals to celebrate being awarded the Best of Honolulu Tropical Handbag for the Sunday Fun Day tote. See you there! Jana Lam will be popping up at the Mom Made Market Hawaii. We'll be stocked up with all your endless summer essentials at 20% off! Jana Lam Hawaii will be popping up at the Four Seasons Oahu. Stock up on your favorite endless summer accessories! Jana Lam will be popping up in the lobby of the Four Seasons Oahu for an after Christmas sale! Jana Lam will be popping up in the lobby of the Four Seasons Resort in Ko Olina. Come to Art+Flea HoliDAZE Market in Chinatown for your last chance before the Holiday! Jana Lam and Misha Hawaii will be holding their annual Christmas Trunk Show in Manoa on December 10th from 4-7pm. Head to Kaka'ako on Sunday, December 4th to shop Jana Lam at everyone's favorite holiday shopping event: A Pinch of Salt for the Holidays! Nordstrom Ala Moana will be hosting a Jana Lam Trunk Show on Sunday, November 27 from 2pm-5pm. And if you are a 2-tier card holder, stick around for the 10 point shopping event!! Jana Lam will be one of the amazing local artisans at the Four Seasons Oahu 'Moonlight Market' on Friday, November 25 from 7pm-10pm. The Jana Lam Design Studio is releasing something new at Eden in Love Boutique's Black Friday Event. Don't miss out! !